Maxine Waters: "Deutsche Bank Is Perhaps The Biggest Money Laundering Bank In The World"
Now that she controls the House Financial Services Committee, Congresswoman Maxine Waters is preparing to finally make good on her threats to subpoena Deutsche Bank to get the "full story" on President Trump's financial relationship with the only major bank that would lend to him following a series of Trump company bankruptcies during the 1990s. And as Waters prepares to let the subpoeanas fly, what better way to alert the broader financial industry that she is not playing around than to sit for an interview with CNBC's chief political correspondent John Harwood? 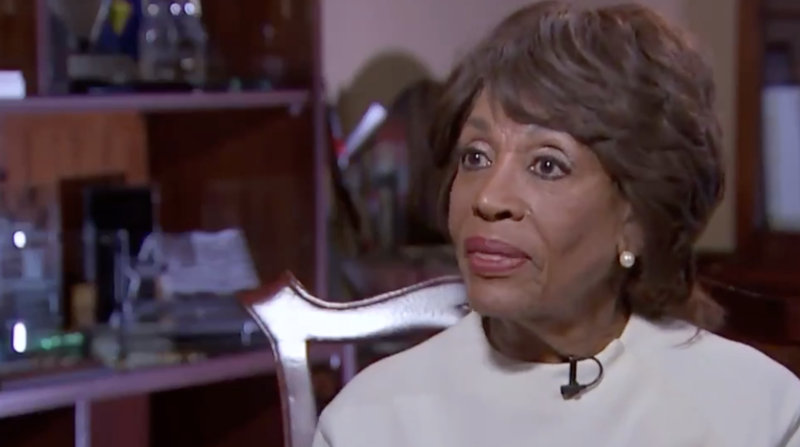 During a brief interview that aired on Friday, Waters told Harwood that her goal is nothing short of exposing Deutsche Bank's involvement in helping the president launder money and avoid taxes (allegations that haven't been substantiated by any media reports or Mueller probe indictments - or any information that has found its way into the public awareness over the past two years). According to Waters, "we already know that Deutsche Bank is one of the biggest money laundering banks...in the world." And there have been rumors about Trump possibly committing financial improprieties during his business dealings. So, in Water's estimation, the probability that her probe will uncover some kind of smoking gun is probably pretty high. John Harwood: What is your objective in the joint investigation that you plan with Congressman Schiff of Deutsche Bank? Maxine Waters: We know that Deutsche Bank is one of the biggest money laundering banks in the country, or in the world perhaps. And we know that this is the only bank that will lend money to the president of the United States because of his past practices. He won’t show his tax returns and we have a certain information that leads us to believe that there may have been some money laundering activity that might have been connected with Mr. Manafort, with some people in his family. John Harwood: Do you believe that money laundering has been a significant part of President Trump’s business? Maxine Waters: I know that there are a lot of rumors. I think we need to learn more about the finances of the president of the United States, and he’s hiding that information from us. He’s not disclosing that information. And I think we need to delve deeper into that and find out what is going on and whether or not money laundering has been involved and whether or not there are connections with the oligarchs of Russia. So does Waters believe Trump is guilty of corruption (which would imply wrongdoing following his inauguration)? She refused to answer the question directly, but instead listed off a litany of Trump's financial foibles, from his bankruptcies to reports that he stiffed contractors and subcontractors. John Harwood: Do you believe, based on what you know now, that the president is corrupt? Maxine Waters: I believe that this is a problematic president who has proven that he has taken advantage of others in the past. I know that he was fined and I do know that the attorney general of New York made him reimburse at least $25 million. We know that he has had bankruptcies. We know that there are a lot of stories he hasn’t paid contractors, he hasn’t paid subcontractors. We know a lot about the history of this president and it doesn’t look good. ... So, we think that in addition to what Mr. Mueller is doing and now what we are able to do with our subpoena power, we’ll find out more and we’ll be able to answer that question directly. In a surprising show of mettle, Harwood confronted Waters about the corruption allegations that have dogged her political career. John Harwood: Now, do you think that the fact that you’ve taken some criticism about conflicts of interest — you were on a watchdog group’s list of most corrupt members of Congress — does that undercut your ability to pursue these issues? Maxine Waters: No, absolutely not. First of all, all of the questions were answered, I was totally exonerated and found not to have done anything wrong. And the group that was involved in that was not an official group. It was simply a nonprofit operation that decided that it was going to take on the responsibility of choosing members that they didn’t necessarily like. But whatever they tried to do to me didn’t work because it was proven that I had done nothing wrong. But he followed that question up with a softball: Asking Waters what she thinks of some of the media's favorite sobriquets for the California Congresswoman. John Harwood: So you think the "Angry Maxine," the "Kerosene Maxine," has been exaggerated? Maxine Waters: I don't know about those labels. I do know this, that oftentimes right-wing conservatives will label you, they will call you names. I think you have to look at where it comes from. If it comes from people who are diametrically opposed to me and my philosophy, and what I care about and what I've worked on, then it is not credible, and so I pay no attention to that. That's a lot of talk based on so little actual evidence. With this in mind, we can't help but wonder: What is Waters going to say if her probe comes up empty handed?